Rollaway Bed Size 30 x 72 in. 30 x 75 in. 32 x 72 in. 39 x 72 in. 36 in. x 72 in. 39 x 75 in. 48 x 72 in. 48 x 75 in. Our satin sheets are lightweight, strong and resistant to creasing, shrinking, stretching, mildew and abrasion. They are readily washable and are not damaged by sunlight or weather and are resistant to moths and mildew. Our satin sheet sets come with a top sheet, a fitted bottom sheet and one pillowcase. They are generously cut to fit a mattress as thick as 16 inches. Care Instructions: Wash before using. Machine wash in cold water. Do not use bleach. Tumble dry with very low heat. Wash separately to guard from color migration. 95% of our orders ship with 10-15 business days. Please allow standard ground transit time depending on your location. Please allow extra time for comforters. 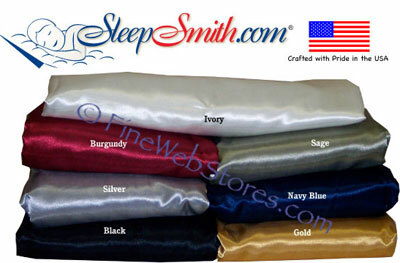 Complete 100% satin sheet set consisting of top sheet, fitted bottom sheet, and matching 1-2 pillowcases. Proudly sewn in the USA! Available in various colors.